It is a dream come true when a person owns his/her apartment, isn’t it? Each and every room can be decorated with your terms. And yes, with all these furniture items out there, you may have trouble in choosing the right ones. And yes, as you enter the house, you need to feel the warmth of your home so why not first begin with a perfectly decorated living room? A Living room has always been the first thing a visitor or guest judges. Ah! Imagine going to your friend’s house, and you just love the decoration. Wouldn’t you want the same thing for your living room? Well, in this article, we will be talking about some top 20 modern living room ideas. It has the contemporary touch to it and has been loved by thousands of people across the globe. Top architects of the world have given these ideas. So, yes, you can have an Italian, French, German, or English styles living room. All the 20 ideas shared in this article will undoubtedly change the phase of your living room. Your living room wouldn’t be dull anymore; it will be stylish and utterly mesmerizing. If you are looking for something extraordinary such as a living room with perfect sunlight, then this living room idea is just meant for your taste. In this, you don’t just have one window, but multiple windows. This living arrangement is suitable for anyone who loves the natural sun or moonlight. If you’re one of them, you can surely get this! And yes, to this living room, you can add a light colored sofa set. You can even get a glass coffee table to add a better presentation to the room. And yes, don’t forget to add a beautiful painting. And with everything in its place, your room will look absolutely gorgeous whether it is day or night. If you are someone who loves being in a simple environment with silence and peace, then this is the best loving arrangement for you! When someone loves peace and silence, they need everything clear and simple in their room. Not everyone loves their rooms cram-full of various furniture items. It is understandable! In this living room idea, you only have a few sofa sets. These sofa sets are usually seen in therapy rooms, and it is absolutely okay if you have them too. If you’re a writer, a musician who loves their peace and silence, then this idea is perfect for you. If you are a writer or someone who loves reading while they enjoy their coffee, then this is a perfect living room idea. Ah! This is a perfect living room. It has everything a book lover would ever want. In this room idea, you have a wall covered with books. You can also, make a space for a TV and all. And when it comes to furniture, just go with a perfect Eileen Wooden Sofa sets. These are comfortable, and just ideal for a living room. And yes, don’t forget to add a furry, fluffy rug and a coffee table on it. Now everything is perfect for a book lover! Love a room with large glass that brings in the moon and sunlight? This is again a very beautiful room where you can enjoy your day and nights without switching on the light. You can enjoy a horror movie at night with your friends and family. You can obviously get mesmerized by the beauty of sunlight spreading in your room. And yes, now you can read and write and work as you’re enjoying the shaft of sunlight. Here you can keep two sofa sets like white and grey. And yes, the best thing is to add a fireplace in a wall covered with wooden plates. Love wooden style? These are perfect for anyone who loves the simplicity with a touch of class. In this living room idea, you can add wooden plates on the ceilings. You can get the floors with different wooden plates. Get a perfect modern style sofa sets with a bench, and you’re good to go. And yes, to make this fancier, add some potted plants here and there, with modern lamps. Simplicity with class, everything in one room. This is again a great idea for someone who loves to spend their time in the moon or sunlight. In this living room idea, you can have your two parallel walls with sliding glass. Keep the sofa set in the middle wall. And yes, to make this even fancier, add a tall wooden styled TV-stand. You can also, turn this into a theatrical style room with perfect theater speakers. Yes, you can enjoy watching movies at night with a perfect sound system while the moonlight enters the room. Even if you are a musician and a songwriter, enjoy the moonlight and your music. If you are fond of a living room, then this loving room idea is just for you. This is a big living room with one wall completely dedicated to large glass sliding doors. The room is painted all white. Even the sofa sets can be all white with a little wooden style here and there. You can have a fireplace with white or grey marble. This will just upgrade your living room appearance. If you like, you can add some potted plants here and there. And yes, if you are a book lover, then yes, few white shelves wouldn’t be a bad idea. This is another all-white living room if you are looking for decorating your small living room. You don’t need a big living room, and if you do have a small one, this is perfect for you. You can paint it all white. Get a simple wooden plank on the floor with a light creamy wooden loop pile carpet. And yes, of course, add a perfect white sofa set. You can also add some tall white cases with potted plants. And yes, if you love painting, get some all-white paintings too. If you have a house near a lake, then why not get a perfect side of it? Yes, you can definitely enjoy the lake from your living room. All you need is to get a wall covered with glass on one or both sides. You can just enjoy your nights with a perfect scene of the lake. And yes, your morning will be full of beauty. If you are a photographer, you can enjoy this even more. A simple cup of coffee on the table, and a perfect angle of the lake, just perfect! If you are looking for a room that hypnotizes you with the calm color of blue with a perfect shaft of sunlight, then this is for you! You can get a wall painted with a simple blue paint. Add an antique looking mirror in the middle with a simple looking sofa. Add a coffee table to the room with a side table. You can add a potted plant somewhere and be mesmerized in the room’s decor. You can also, get a perfect night in, by adding some modern looking tall lamps. You can enjoy your night in with a perfect book while your room gets enhanced by the moonlight. If you want a living room with a tall ceiling, and with all-white settings, then this is for your taste! In this living room idea, you have all the walls painted white, including the ceiling. The ceiling has some woody planks that hold the modern chandelier. And yes, you can dedicate one whole wall and install a few windows with beautiful white silk curtains. And to make this fancier, you can definitely go for light colored sofa sets like sky blue and white. Get a grey square coffee set and you’re good to go. In this living room setting too, there is the tall ceiling. This living room is on the top part of the house; the attic. If you have an attic, you can turn it into a perfect all-white living room. Trust me, you can have great parties up there! Even if you don’t have an attic, you can get an attic-style living room. Get your room painted all white and add some bright colored potted plants in the corners. Don’t forget to add white colored sofa sets with perfect, yet unique side tables. In this living room, you can definitely go for the all-white idea with a little different touch. You can add black hanging ceiling chandeliers. Add two different sofa sets with a perfectly suitable coffee table. You can get some unique looking glass vases to decorate the room. And yes, get a dark wooden floor to make it a better place. To make this room more beautiful, you can turn a wall into a glass wall, and enjoy bathing in the sunlight. 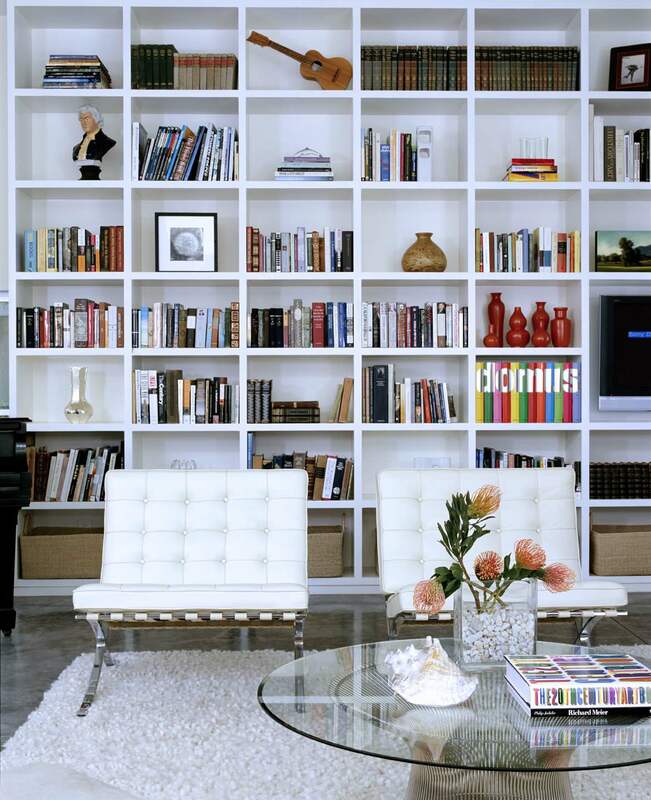 If you are a book lover and love collecting books, then this is a perfect living room for you. Here, you can get mini bulb string lights on the ceilings. Dedicate a wall and transform it into a wall full of books. You can add some leather sofa sets, a few potted plants. And yes, you can even add some paintings and enjoy the room! Read any book while the sunlight hits the room, and enjoy the warmth of the sunlight while you are lost in the words of great writers. If you have an attic and you want to change it completely, then turn it into this piece of art. Again, just get all the walls painted white. Get a candle themed chandelier. You can also, get windows installed in every wall. To make this more amazing, just add a grey sofa set in the form of U. You can even have a grey themed piece place right in the middle. Again, you can go for some potted plants. Add some paintings on the walls. And don’t forget to get a glass table and decorate it with beautiful ceramic lamps. You can also go for this simple style if you want to change your attic into a living room. With all the walls painted white, you can get a simple black-wooden themed stand in the corner, and add books and showpieces. You can have 2 huge paintings hung on the wall. And get a TV and TV stand in between. Add any type of sofa set with lots of cushions. Get a tall black lamp with a short coffee table. If you love the color, cream, then you can get this living room idea! In this, your whole room is painted with a cream color. The ceilings have a simple lightning arrangement. You can get two wooden tall shelves installed in the wall with an artificial fireplace in the middle. And yes, do get a perfect painting on the top of the fireplace to make it fancier. Get a cream-wooden themed sofa set with a glass coffee table in the middle. Add a tall vase with a tall lamp, and you’re set to go. If you love these both colors, why not get a new living room with these two colors mashed up on the walls? In this living room, you can get a few walls painted white, while others have blue coated on them. You can get white curtains too. And yes, get two sofa sets with one white and the other blue color. Let the floor have wooden planks and you’re good to go. This living room style is someone who loves the natural light. Yes, you can enjoy the sunlight or the moonlight while you spend your time in the room. All the walls have installed tall windows with a perfect view. You can have a garden and enjoy the view from the living room. Get dark shade wooden-planks on the floor with a perfect sofa set. You can keep a black accent chair and enjoy reading a book while you bath in the sun or moonlight. If you love the idea of getting a huge window, then this is perfect for you. You can paint the room white and get a unique golden design on top of it. Let the walls have a unique taste of white and golden patterns. Get some wooden sofa sets with a rectangular center table. Add some side table with a white lamp. You can add some show pieces on the table, and you’re good to go. So, guys wondering which one to go for? Well, have a talk with your architecture or an interior designer, and get a perfect living room. Enjoy your time with a perfect surroundings.